Renal cell carcinoma (RCC) accounts for 2%–3% of adult cancers. In adults, they are responsible for about 80%–85% of primary renal tumors and about 90%–95% of malignant renal tumors. The incidence increases in the fifth and sixth decades and is 1.5 times more common in men than in women. RCC most commonly causes lung metastasis (50%) and second commonly causes bone metastasis (25%–50%). Apart from these, metastasis to the liver, brain, and skin is rare. The manifestation of the symptoms depends on the mass effect of tumors, metastatic lesions, hemorrhage, and paraneoplastic syndromes.,,, It has been reported that the primer tumor may be identified after metastasis in about 30% of patients with RCC, and in these cases, the primary presentation often involves a pathological fracture. The rate of RCC metastasis to the head-and-neck region is reported as 15%. RCC has been shown to metastasize to the parotid gland, tonsillar, thyroid gland, paranasal sinuses, nasal cavity, and tongue in the head-and-neck region.,,, However, no pathological fractures due to cervical spine metastasis have been reported. In addition, it is a very rare cause of spontaneous severe radicular arm pain. Our case was presented after surgical treatment with late period results. A 47-year-old male presented with severe pain characterized with radicular behavior spreading on the neck and right arm and an onset of numbness in the first and second fingers of the right hand. It was learned that the patient had slipped and fallen down on his back about 20 days before but had no complaints afterward, and 10 days after the minor trauma, he suddenly started to have very severe pain in the neck root. His pain had gradually grown progressively and begun to spread to the right arm. 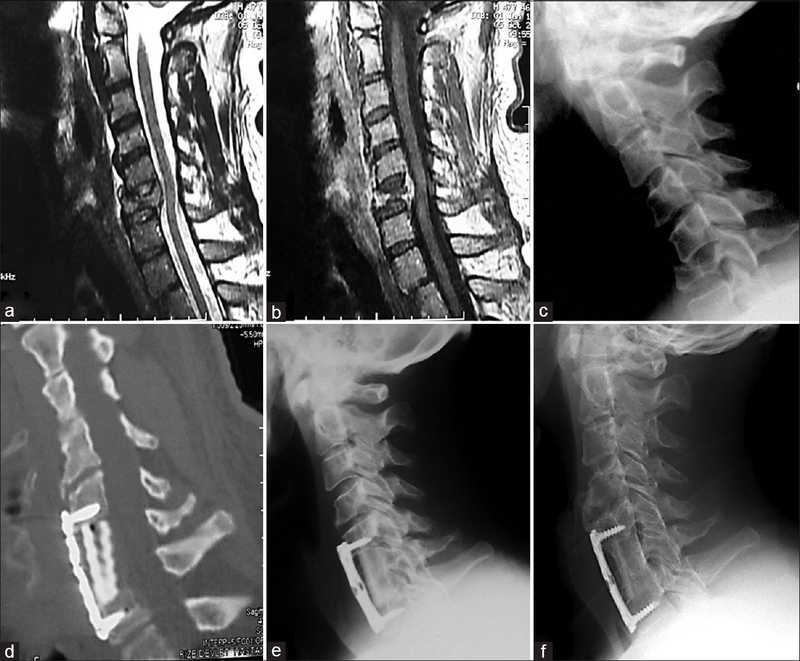 Radiological findings showed compression on the spinal canal and deterioration of the cervical lordosis due to height loss in the C6 vertebra corpus [Figure 1]a,[Figure 1]b,[Figure 1]c.
In the present case, it was thought that the pathological compression fracture (collapse) in C6 corpus may be secondary to infection or due to metastasis. In the examination for a primary etiologic cause, a large mass with a diameter of 10 cm was found in the left kidney in abdominal computed tomography (CT) images. Due to his severe pain, a cervical sixth vertebrae corpectomy was performed through the anterior without delay. A 7–8 cm bone autograft was taken from the middle section of his own right leg fibula to put it in the gap created after the corpectomy. The top and bottom ends of the fibula graft were smoothened with a high-speed drill. The size of the graft was tried to be kept high, especially to ensure physiological lordosis. During the surgery, the fibula was implanted at the distance cleared by applying traction on the patient's head. After ensuring that the lordosis was obtained, and the graft was in the right place, the fibula was supported using an anterior plaque to reduce the likelihood of the fibula to come loose. Postoperative cervical vertebra was controlled by lateral cervical X-ray and CT [Figure 1]d and [Figure 1]e.
Postoperative pain occurring on the leg of the case did not prevent mobilization on the 1st day. On the 1st day after the operation, his radicular pain in the neck and in the arm was gone almost completely. The pain in his leg gradually diminished at the end of the 1st week. 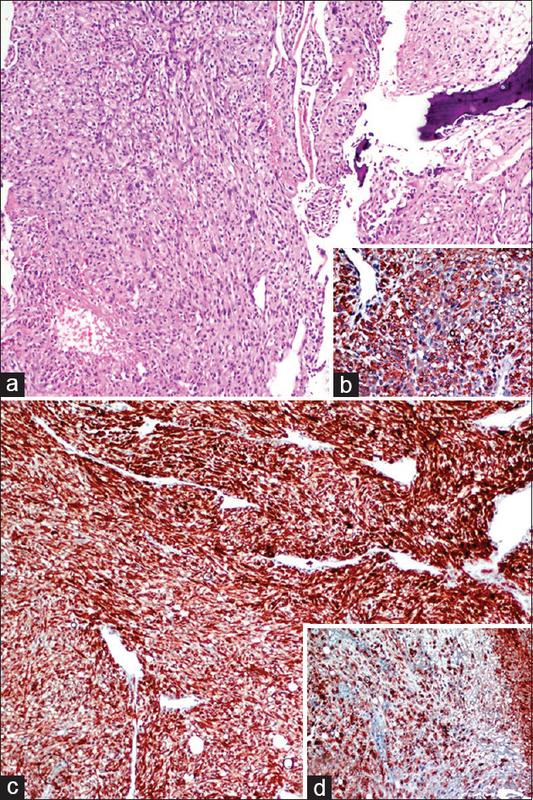 The definitive pathology was evaluated as RCC metastasis [Figure 2]. Radical nephrectomy was performed 2 weeks later for the other, newly identified kidney mass. At the end of the 6th year of the case, there was still no recurrence of a tumor lesion on the cervical vertebra and the rest of the body. At the end of the 6th year, radiographs of the patient were being followed up to see how well the fibula was fused [Figure 1]f.
In patients with RCC, the tumor stage is the most important factor affecting the prognosis and survival of the patient. The most common staging classification for this is the Robson and tumor, lymph node, metastasis (TNM) classification. Although the Robson classification is simpler and more frequently used in the imaging literature, the TNM classification includes more subgroups and is used because it better identifies the anatomic spread of a tumor., Our case was evaluated as Stage 4 because of his having a distant metastasis. Nevertheless, radical surgery is still the only effective and curative method in localized as well as in advanced RCC cases. However, the ongoing surgical approaches have developed over the years. A radical surgical approach and planning of the strategy have been reported to be determinant in the patient's prognosis also for RCCs spine metastases. For all these reasons, a curative surgical approach was planned. Anterior decompression and fusion with cervical corpectomy are commonly performed in multilevel degenerative cervical myelopathy surgeries and in other pathologies that originate from the cervical corpus and occupy the spinal canal. Similarly, in primary or metastatic tumoral pathologies, they are applied to prevent the anterior pressure on the spinal cord. However, the repair of a deformity resulting from the surgery of a malignant tumor is a serious problem, and it is necessary to decide which instrument will remain intact. The most appropriate bone grafts are the autogenous grafts of the patient himself so that kyphotic deformity does not occur in the vertebral alignment after anterior cervical corpectomy, and fusion can be performed without problems. The choice of materials to be minimally affected from radiotherapy and chemotherapy after RCC surgery is very important because it is desired that these treatment methods do not interfere with bone fusion. For anterior fusion, bones from fibula, tibia, costa, and iliac crest are usually used. These autografts may not be suitable for each intervention due to different problems. In our literature review, fusion rates have been reported to vary between 34% and 97% after anterior cervical decompression and fusion operation with auto or allograft. Autografts from allografts have the highest fusion rate compared to this study. After medical oncologic treatments, which were also applied in the present case, we observed that there was no interference with the fusion of the autograft and sufficient fusion was achieved. In addition, no spinal involvement was observed in all body scans performed with positron emission tomography. It is also reported that the iliac crest of the possible autografts may not be of sufficient length for the corpectomy space and is more painful than other anatomic regions after the transfer. Hematomas and infections are also reported to occur frequently after taking grafts from the iliac crest., Costas are less preferred because they are not as robust as necessary and their shapes are not suitable. Although tibial grafts are of adequate strength and proper shape, it can be observed that stress fractures can occur in the thinned tibia in the donor area due to the body weight. Gore reported that there were fractures in the donor area at follow-up in 15 of 107 cases using tibial grafts., Fibular grafts have been used for multiple levels of anterior cervical fusion in recent years. Even though the fibular graft can produce the proper shape and sufficient strength, the fusion time can exceed 1 year due to the limitation of the fusion surfaces. In the case that we presented, at the end of the follow-up period of 6 years, we found that adequate fusion was achieved in control graphs despite the receipt of radiotherapy applied to the neck after a malignant tumor surgery. Fibular autograft used to provide physiological lordosis and bone fusion was observed to be a good choice after surgical treatment for solitary metastasis of malignant RCC to the cervical vertebra. Although the patient was at Stage 4, the complete realization of a tumoral resection at all foci can provide cure for RCC. Türkvatan A, Akdur PÖ, Altınel M, Ölçer T, Turhan N, Cumhur T, et al. Preoperative staging of renal cell carcinoma with multidetector CT. Diagn Interv Radiol 2009;15:22-30. Çakır M, Polat G, Sade R, Karaca L, Ogul H, Kantarci M, et al. Renal cell carcinoma metastasis presenting as an osteosarcoma. Spine J 2016;16:e605-6. Reitz M, Mende KC, Cramer C, Krätzig T, Nagy Z, Vettorazzi E, et al. Surgical treatment of spinal metastases from renal cell carcinoma-effects of preoperative embolization on intraoperative blood loss. Neurosurg Rev 2018;41:861-7. Mosele GR, Caggiari G, Scarpa RM, Doria C. The treatment of vertebral metastases from renal cell carcinoma: A retrospective study. Minerva Urol Nefrol 2017;69:166-72. Kotil K, Tari R. Two level cervical corpectomy with iliac crest fusion and rigid plate fixation: A retrospective study with a three-year follow-up. Turk Neurosurg 2011;21:606-12. Wasserman JK, Tsai EC, Glikstein R, Mai KT, Jansen GH. Metastatic renal cell carcinoma mimicking a schwannoma in a dorsal root ganglion: Case report. J Neurosurg Spine 2015;22:314-7. Sciubba DM, Petteys RJ, Dekutoski MB, Fisher CG, Fehlings MG, Ondra SL, et al. Diagnosis and management of metastatic spine disease. A review. J Neurosurg Spine 2010;13:94-108. Koksal V, Kayaci S, Bedir R. Split rib cranioplasty for frontal osteoma: A case report and review of the literature. Iran Red Crescent Med J 2016;18: e29541. Sunumu O, Serbest S, Kaya E, Gökçe H. Treatment of radius aneurysmal bone cyst with fibular autograft: A case report 2012;17:75-7. Laitinen M, Parry M, Ratasvuori M, Wedin R, Albergo JI, Jeys L, et al. Survival and complications of skeletal reconstructions after surgical treatment of bony metastatic renal cell carcinoma. Eur J Surg Oncol 2015;41:886-92. Gore DR, Gardner GM, Sepic SB, Mollinger LA, Murray MP. Function following partial fibulectomy. Clin Orthop Relat Res 1987;220:206-10. Gore DR. Severe bilateral internal tibial torsion in an adult, corrected by O'Donoghue's derotation osteotomy. Am J Orthop (Belle Mead NJ) 2000;29:394-6.